When photographers talk about the “depth of field” in an image, they’re referring to how much of the picture they choose to have in focus. You may think “but don’t I want all of my image to be in focus?” Frequently you do, but sometimes you can bring more attention to your subject by reducing the depth of field in a scene, making the background soft and blurry. If you own a DSLR but aren't experimenting with your aperture settings, you're missing out on one of the most useful tools in a photographer's arsenal. Here's a primer to get you started. The upper image has deeper depth of field than the lower image. Click on the picture for a closer look. By choosing how much depth of field to have in your shot, you can focus the viewer’s attention in a specific place. This makes depth of field control one of the most important creative decisions that a photographer makes. 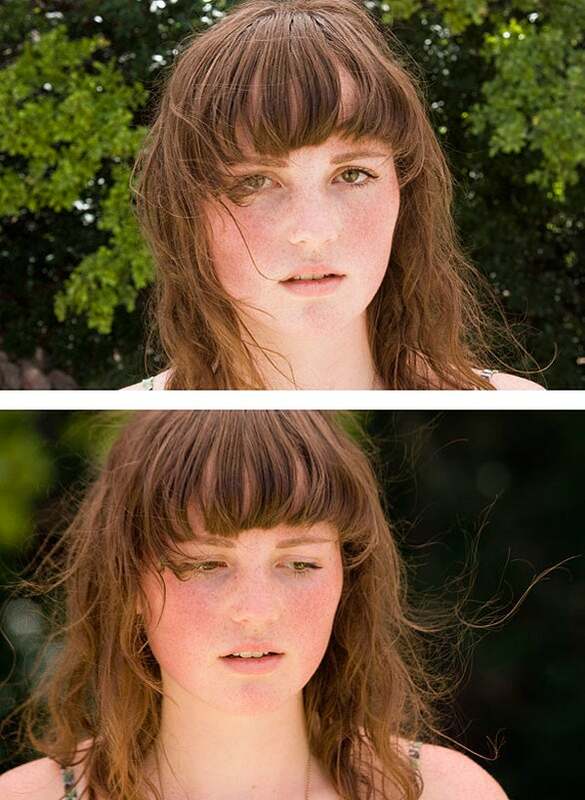 This example shows the same image shot with deep depth of field (top), and shallow depth of field (bottom). In the lower image with the soft background, the depth of field is about two or three inches deep. That doesn’t mean that only the two to three inches in front of the lens are in focus—the depth of field in a scene is always measured around the point of focus. I focused on her eyes, so the depth of field extends from an inch or so in front of her eyes, to an inch or so behind. Everything closer and farther than this small area gets progressively softer. Depth of field is controlled by changing the aperture setting on your camera. Like your eye, a camera lens has an iris inside that can open or close to let in more or less light. You control the size of this hole, or aperture, by changing the aperture setting, which is measured using a scale of f-stops. Smaller f-numbers denote larger apertures, which mean less depth of field. To change your aperture, you must have a camera with an aperture priority or manual mode. (Most cameras with aperture priority also have a full manual mode). On most cameras, Aperture Priority mode is indicated on the mode selector by an A, though Canon cameras use Av. When in aperture priority mode, you choose the aperture you want, and the camera automatically picks a corresponding shutter speed to yield a good exposure. For details on changing modes and using the aperture priority mode, consult your camera’s manual. If your camera doesn’t provide a mechanism for controlling aperture, then you won’t be able to choose a particular depth of field. These days, all SLRs have priority and manual modes, as do Micro Four Thirds cameras, and some advanced point-and-shoot cameras, such as the Panasonic Lumix LX3 and Canon PowerShot S90. However, a camera with a smaller sensor has inherently deeper depth of field. What this means is that it’s difficult to achieve extremely shallow depth of field with a point-and-shoot camera, even if you have manual controls. Once you know how to control your aperture, you’ll need to figure out how much depth of field you want in your photo. For example, in a portrait it’s nice to have a shallow depth of field so that the focus is on the person’s face. But shallow depth of field is also handy any time you need a way to separate a subject from a busy background—street shooting, event shooting, and many other situations can benefit from a reduction in depth of field. This image has very deep depth of field. Everything from the foreground to the horizon is in focus. You'll usually choose deep depth of field for landscape shots. There are times when you’ll want to ensure a deep depth of field. Landscape images, for example, can work better when everything in the frame is in focus, so you’ll want a deeper depth of field. 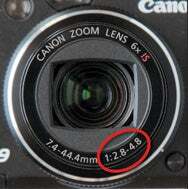 To do this, choose a small aperture, which will be denoted by a larger f-number. Product shots, certain types of still life images, and any shot where you need to see both foreground and background details will also benefit from deep depth of field. The landscape photo tradition is for images of vast areas, with great detail in every part of the picture. Achieving such detail requires deep depth of field. Similarly, if you’re shooting an object that you’re going to put on eBay, you’ll want every part of the object in focus, so deep depth of field will be necessary. Note that every lens has a set aperture range, and some lenses can open to a wider aperture than others. Your lens should list its aperture range on the ring on the front of the camera. For example, the markings on this PowerShot G9 indicate that it has an aperture range of f2.8 at its widest angle to f 4.8 at it’s most telephoto. If you have a lens that can open up very wide (also called a fast lens), you’ll want to think about how shallow you want the depth of field to be. If you have a very fast lens, and you open it up to its largest aperture, you might have a difficult time focusing. This will make your backgrounds go too soft and make it difficult to keep the correct parts of your image in focus. The depth of field in this image is so shallow that her eyes are in focus while her eyebrows are not. This is a portrait shot with an f1.2 50mm lens opened all the way. Here, the depth of field is so shallow, that the girl’s eyes are in focus but her eyebrows are not, meaning the depth of field is only a fraction of an inch deep. When shooting with depth of field this shallow, focus becomes especially critical. While you control depth of field using your aperture setting, camera position is also critical for achieving a shallow depth of field. While you might have your aperture set to a nice wide opening, if there’s nothing visible in the background, then you won’t be able to tell that the image has shallow depth of field. In other words: the perception of depth of field in an image is dependent on the size of the objects in the background. When you shoot with a wide angle lens, objects in the background are very small, so it can be difficult to see that your image has shallow depth of field. If you want to show that there is a shallow depth of field, be sure to compose your shot so that there’s something big in the background to reveal the shallow focus. 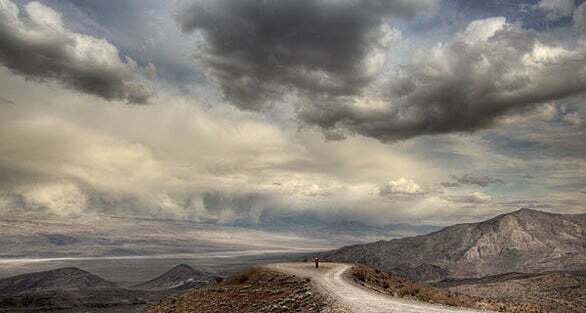 As mentioned earlier, when you shoot landscapes, you’ll usually want to choose a deep depth of field. But, there are two important factors to keep in mind when shooting deep focus. First, it’s tempting to just dial in the largest f-number you can, but this is usually a bad idea. As aperture size gets smaller, your image can suffer from an optical effect called diffraction, which reduces the sharpness in your image. I typically find that once I go smaller than f11, I see a noticeable drop in sharpness. If you’re shooting a landscape, and you dial in f22 to try to ensure deep depth of field, there’s a good chance you’ll have an overall soft image, because of the diffraction problems introduced by your small aperture choice. Second, remember that depth of field is centered around your point of focus, with some of the range in front, and some behind. When shooting a landscape, if you focus on the horizon, then some of your depth of field will actually fall behind the horizon. In other words, you won’t be making the best use of the depth of field that’s available, so your foreground might end up out of focus. Until you get better at judging distance, you’ll want to bracket your focus. Focus bracketing means that you shoot a series of frames, focusing at different distances. If you bracket, there’s a better chance that one of your resulting images will be properly focused.